These versatile generators are perfect for aImost any application requiring steam from 0-100 PSIG. Each unit is complete with automatic features, including pressure and liquid level controllers, ASME Code pressure vessel and safety valve and are fully tested under power. Each one must pass Sussman's rigid quality control inspection before it is shipped. 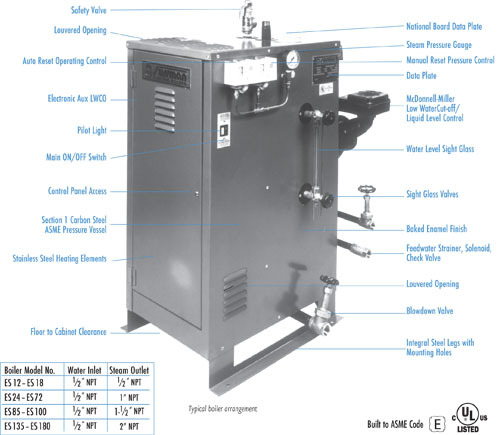 Sussman Electric Boilers - your source for fast economical steam energy. Applications include: Steam for tanks, reactors, distillations, autoclaves, dyestuffs, food products, cosmetics, paraffins, glues, steam jacketed kettles, sterilizers, pipe tracing and humidification. Built to Section 1 of ASME Boiler and Pressure Vessel Codes. UL listed. Sussman Electric Boilers produces steam and hot water boilers and feedwater systems for industrial, commercial and specialized applications.